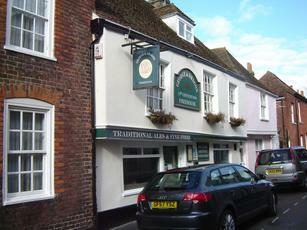 The George & Dragon was my favourite pub in Sandwich. It is tucked way out of the way in one of the maze of narrow, residential streets and it had plenty of character. There were only a few in. But these soon included the landlord and landlady of the Crispin Inn, which I was still to visit. Ales on were Butcombe Bitter, Otter Amber & Mad Cat Mild Disobedience. I chose the mild, which was a decent drink. Worth seeking out. Surprised by the low rating here. Quite possibly not a true reflection of well kept local beer (Wantsum), tasty food and excellent service. A really pleasant lunchtime visit. Yes, it is geared towards victuals, but the ale is excellent too. It scores lowly because it isn't really a pub, more of an eatery. beer was okay but there was only room at the bar area for about 5 or 6 drinkers, most of the place is laid out for diners. 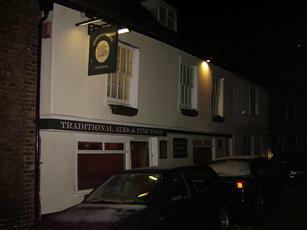 A very attractive small pub that feels like a back street local but must get tourists. Good welcome, bar snacks and OK beer.